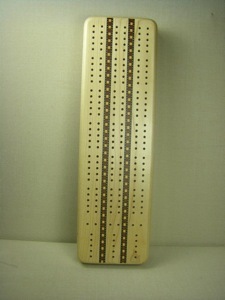 Lovingly handcrafted in American Maple, ornately accented with colorful wooden inlays, this large sized cribbage board features three tracks and hidden slides that hold cards and pegs. 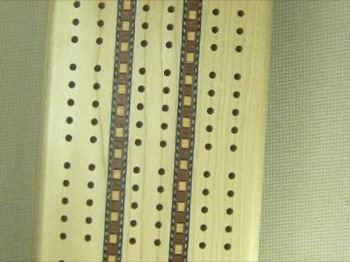 Gift box, cards, wooden pegs and instructions are included. Lies 12 inches long, 3.5 wide, and 1.5 inches high. Environment conscious made in the USA. For every tree used, ten are planted in its place.